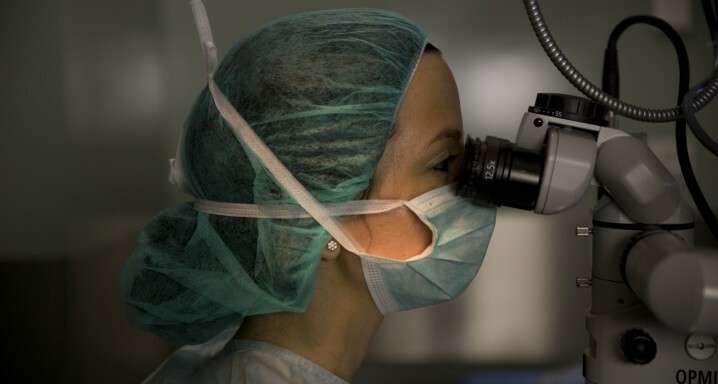 Nowadays, two corneal refractive surgery techniques are mainly used, both performed by the team at the Institut de la Màcula. LASIK corneal refractive surgery is the most widely performed. This consists of modifying the shape of the cornea to alter the eye's total degree of refraction. The initial layers of the corneal tissue are carefully separated (the corneal flap), either mechanically or with a femtosecond laser, and then an excimer laser is used to shape the cornea and correct the desired dioptres. Finally, the area treated is covered with the corneal flap, with no suture required, to restore the normal surface of the eye. Photorefractive keratectomy (PRK) with excimer laser is a surgical technique used to correct dioptres with superficial ablation of the cornea. The laser is applied directly to the outer surface of the cornea to sculpt a new optical surface under the epithelium.